6. How in the import directive specify that all classes from this package can be used? 8. What is a compiled module in Java? 9. What are the requirements for the implementation of the compiled module (.java)? 10. How many classes can be implemented in the compiled module? 11. What is the purpose of .class files? 12. What are the benefits of using the ‘package’ and ‘import’ directives? Each project in the Java language uses so-called packages in its work. A package is a separate module (namespace), to which corresponds the directory of the same name (folder). The package contains libraries (groups) of classes. These classes are combined in the same namespace or package. The number of classes implemented in the package is unlimited. The classes that are declared in the package are implemented in files with the extension *.java. Packages can have a variety of levels of attachment (subdirectories, subfolders). At different levels of the package nesting, the names can be repeated. 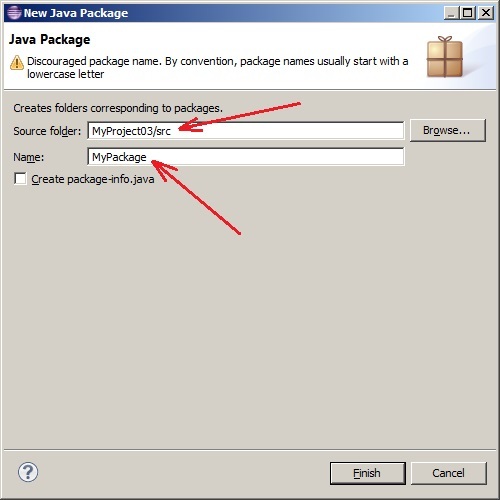 In the Java Eclipse system, the package connection is a standard command. A project must be created in advance. The project can contain an arbitrary number of packages. Each package can have an variuous number of classes. As a result, the window shown in Figure 1 opens. The window displays the name of the project and the package that will be placed in this project. After selecting the Finish button, the following occurs. A special folder (directory) with the same name corresponds to the project named MyProject03. Several subdirectories (subfolders) are created in this directory. One of them is a subdirectory called src. In this subdirectory, the MyPackage directory is created, corresponding to the created package. ClassName – the name of the class. Similarly, access to the class is formed in the case of more complex nesting levels. Figure 2 shows the hierarchy that packages can form. As you can see from the figure, 3 packages with the names MyPackage01, MyPackage02, MyPackage03 were created in the MyProject03 project. Each of the packages has a class with the same name MyClass01. Thus, the same names are separated. Below is the demo code that creates the MyClass01 class objects, which are located in different packages (folders), according to the diagram in Figure 2. As you can be seen from the program code, the class is accessed from the package using the separator ‘ . ‘ (dot). In order to reduce very large lines of access to the class name, the import directive is used. The import directive allows you to shorten very long rows of accesses to classes (interfaces, enumerations) that are implemented in packages. ClassFileName – the name of the file with the extension *. java, in which the class or group of classes to which you want to access by abbreviated name is implemented. The following is an example of connecting and using the Circle class from another package and another class. Package – a package name with a class library. The ‘package’ keyword specifies the name of the library, which can include a different number of compiled modules. Compiled modules are files with the .java extension. then this means that this module is part of the library named PackageName. Each compiled module is a file that contains the source code in the Java language. This file has the extension “*.java”. The file name is the same as the name of the public class that is implemented in this module. This requirement is mandatory. Each compiled module can contain no more than one public class. The compiled module is included in the package. The compiled module is included in the package. There can be any number of compiled modules in a package. in the compiled module there can be no more than one public class. If there are other (additional) classes in the compiled module, then they must be hidden (without the public modifier). A compiled module can have any number of classes. However, there must be only one public class. The name of this class must match the name of the compiled module. Files with the extension .class are obtained as a result of compiling files with the extension .java (compiled modules). Files with the extension .class are intermediate files, which are then combined by the linker into the executive module. For example, in the Delphi programming language, the temporary compiled files had the extension *.dcu. In the C++ programming language, the temporary compiled files had the extension .obj. After linking out of these files, we got *.exe file (executable module). After that, the files with the extension .class are combined into a package and compressed by the JAR utility. This is all done by the Java interpreter. Using the package and import directives makes it convenient to divide the namespace so as to prevent conflicts between different Java class developers. Let Java Eclipse create a project named Project03. 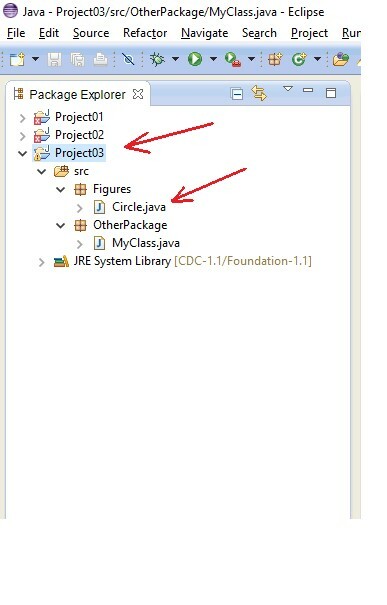 The project is located in the default folder that is used by the Java Eclipse system. The two packages with the names Figures, OtherPackage are created in the project. 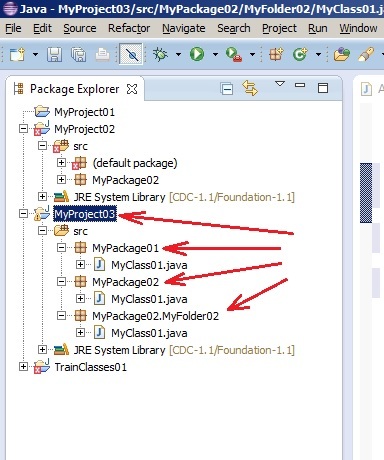 In packages the compile modules are implemented with the names Circle.java and MyClass.java. Figure 3 shows the structure of the Project03 project of the Java Eclipse system. If the compiler encounters the import directive, it generates the full name, taking into account the path to the directory that is written by default on the system. If desired, the default path to the directory (folder) can be changed. Use the full form or full class name in the library. Use the abbreviated form of the class name. In this case, the full name of the package with the desired class can be specified explicitly with the import directive. ClassName – the name of the class (or interface) that is implemented in the PackageName library (for example, ArrayList, BigDecimal, etc.). For example. A code snippet that uses the Vector class from the standard Java library. In this case, the standard Java library is named java.util.